Ah, I knew that would grab your attention! I love interesting words/phrases, and OODLES OF CABOODLES is one of my favourites! Another one that I use a lot is OOMPH! Whenever my choir kiddies sing in a lacklustre manner, then my famous question is: You need to sing with———- and the unison response will be—– OOMPH! I also love the word INCANDESCENT and JE NE SAIS QUOI is a beauty – it rolls off the tongue and caresses the ear…. So today I'm celebrating funky words/phrases. This weekly hop is hosted by Viklit over at Scribblings Of An Aspiring Author. ~Reading: I read a short contemporary romance with a splash of sci-fi (it's the beginning of a series) plus a collection of 7 contemporary stories which revolve around human relationships. ~I signed up for a monthly bloghop over at Write… Edit… Publish. where you are welcome to submit any of the following – flash fiction, poetry, non-fiction, playscripts to a word count of 1,000 words OR artwork and photographs accompanied by your written inspiration in creating your works. There's something to suit every taste! Go and check it out! ~And don't forget the Anti-Blogfest Gary Fest.It's the shortest blogfest I've heard of. You only have to post 3 titles with a short explanation of each. Three lines? Easy peasy! Okay, a little imagination is required for this but you get to be as CRAZY as you want to! Go HERE for more details. So what have you been up to? Do you have a favourite word/phrase that you use constantly? Please share in the comment section… and enjoy your weekend! I like plethora because it's so unique. Read about Denise's new group yesterday. Very awesome. Plethora? It's an interesting-sounding word, so naturally, I googled it to find out its origin… it comes from the Greeks. Can't wait for the Gary Fest! I have so many favorite words. I do like je ne sais quoi. You've been busy. I look forward to seeing all this blog activity. I love funky words and phrases- especially the ones no one has heard of. I had an argument with boy over the word flibbertigibbet (one of my faves). The argument consisted of him saying that it wasn't a word, me saying that it most certainly is, and a great one at that and then pulling out my dictionary app to show him. I'm signed up for both Write…Edit…Publish and Gary's blog hop. Should be fun. Congrats on all the reading and writing! Now flibbertigibbet is a mouthful! LOL But a nice, fun word. 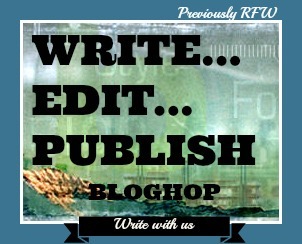 I look forward to connecting with you again on the Write…Edit…Publish bloghop circuit. I've loved the word obtuse every since I heard Andy Dufresne use it in Shawshank. I've also 86'd the instant oatmeal in favor of the real stuff; mmm, mmm, good! Both blogfests look like fun! I have a lot of favorite words. One is serendipity. The anti-blogfest sounds like fun. Lol! Fave word or phrase … Well, I write the word "just" a lot, so I guess I'm a fan of that word! Jungle Oats provides a good start to the winter morning! 🙂 Ah, don't we all have a word that we over use? You're busy busy! Good for you! My blogging has been way off this summer with the kids home and mass revisions. I do miss it. Dr. Suess is on the loose, in a caboose, with a goose and a moose, getting footloose.. Yes, I also like your choices, a certain pizazz about them. I celebrate your celebrations and good for you in keeping busy..
Before I go, arggghhhhh! Blogfests, blog hops, alphabet challenges! Yuck!! And that last anti-blogfest is the ultimate in irony. A peaceful weekend to you. Sounds like a fun blog hop! What in the world is Jungle Oats porridge? Is it like steel-cut oatmeal? Syncopy? I know of syncopation. Are they related? I'm off to google———- I think Jungle Oats may be similar to steel-cut oatmeal… not too sure. I know that it's made of malted sorghum. Fudruckers! and Shakazulu! are my favorite explitives. Sheeshameesh is my third not so explitive explitive. 🙂 Yes, there's a lot happening around these parts, that's for sure! Sheeshameesh! LOL. Is fudrucker a real word? And you do know who Shaka Zulu is? 🙂 I like the sound of sheeshameesh… can I borrow it? Tomorrow I'm going to use as my new word, when the singing is not up to scratch! Lacking oomph and your productivity… ?…somehow it doesn't gel… 🙂 Well, hopefully the "oomph mantra" works for you? Oooh, I love fun and funky words. Some of my favorites are lackluster, forlorn, and extricate. I love to throw these kinds of words into normal conversation and see people's reaction.My boyfriend and I have a made up language of all kinds of crazy words, many of them partially french. LOL. We are so weird. Great to hear you are reading and writing a lot. Keep up the good work! That sounds like a fun exercise, Shell. Hey, maybe you could create a whole new world with its own unique language… that story might just be the next big thing! I'm signed up for the Write … Edit … thingy as well, but I haven't even thought about what I'm going to post for it. Oops! Oh, I have so many unique words that I love, but my hubby is always trying to get me to use "abscond" and I can't get over making up my own–ones that are unique but really express a feel or idea every human relates to. OMG! I hope those "couple thousand words" don't give you a headache… or even worse, nightmares… 🙂 Enjoy the chaos! The Gary fest totally cracks me up LOL. … and in all honesty, the "quickie options" do become meaningless and often doesn't make the grade, as in "been there, tasted that, so what"… and I find myself gravitating towards the home made option… it never disappoints! Oomph is sooo cool. So is Gary at Klahanie. I had a post about my favorite word about a month ago. It's excrutiatingly. The word almost sounds painful. I love it. I'm liking the GaryFest & the Write, Edit, Publish blog hop, Sounds cool. I need to check it out. Totally agree about JE NE SAIS QUOI. Had to copy & paste it too or else I would have butchered it when I commented it. :). Hey Mina! Great to hear from you. Don't be a stranger, you hear? 🙂 And yes, check out Write… Edit… Publish… it's a great writing bloghop, and you only need to post once a month. I like the interesting words, Michele! They keep you from getting the doldrums and they make you smile when you read them.